Congress vice-president Rahul Gandhi on Monday said he wanted to see a day when the Chinese people start using a phone that's 'Made in India'. Speaking at a rally in Himachal Pradesh's Chamba, he said, "I want to see that day when a Chinese youth flips his phone to take a selfie and 'Made in Himachal Pradesh' and 'Made in India' are written on his phone." The Congress vice-president further praised Himachal Pradesh Chief Minister Virbhadra Singh and said that he came in the category of the hard working people. "Indira Gandhi ji used to say that there are two types of people - ones who work hard and the others who only take credit of the work. She had said that we should be in the first category as the competition is less there. Our Chief Minister Virbhadra Singh comes in the first category. Prime Minister Narendra Modi comes in the second," he said. Rahul further hailed Himachal Pradesh as the best state in terms of cleanliness, employment, education and power generation. The Congress vice-president has been touring the poll-bound state extensively and addressing the rallies in several districts of Himachal Pradesh. 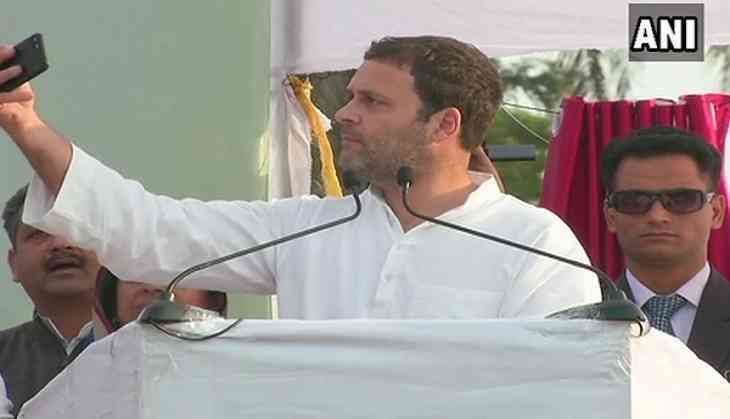 Rahul was on Monday scheduled to hold three rallies in Himachal Pradesh - at Sirmour, Chamba and Kangra. With just three days left for the Assembly elections to take place in Himachal Pradesh, the Congress has also upped the ante against the Bharatiya Janata Party (BJP). Addressinga rally in Himachal Pradesh, the Congress vice-president, earlier in the day, said Prime Minister Narendra Modi had his own interpretation of a saying from the Bhagvad Gita. He also alleged that Prime Minister Modi believes in eating up the fruits of others' labour. "It says in the Gita, 'If your work, don't worry about the fruits of your labour', but Modiji's interpretation is 'eat up the fruits of others' labour; don't worry about doing any work'," Rahul said. Rahul's visit to the hill state holds political significance as it comes a day after Prime Minister Modi hit out at the Congress and termed the upcoming elections in Himachal as 'one-sided'. The polling in Himachal Pradesh is slated to be held in single-phase on November 9. The results will be declared on 18 December.